Turn pressure cooker to saute. Add all ingredients up to steak tips. Allow to dissolve. Pressure cook 45 minutes. Shut off pressure cooker, allow to depressurize naturally. Add cornstarch/water mixture to thicken as desired over saute setting. Serve over rice with sesame seeds and green onions. Posted in Dinner, Instant Pot and tagged beef, korean, pressure cooker. Bookmark the permalink. 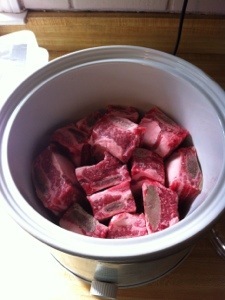 Arrange the short ribs standing upright in the crockpot. Mix rice vinegar, sesame oil, soy sauce, garlic, ginger, brown sugar, and crushed red pepper in a separate bowl. Then pour the mixture (the “cooking liquid“) over the ribs. Cover and cook on low for 9 hours or high for 6 hours, until the ribs are tender. UPDATE for Instant Pot: Use the 6 qt pot. Set the pot to 60 minutes on the Meat setting. Allow to natural release for 15 minutes. Use the simmer function to prepare the sauce. 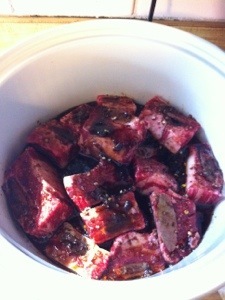 Remove the ribs from the crockpot and arrange them on a platter. Skim the fat off the top of the cooking liquid. In a saucepan, combine the cornstarch paste and the cooking liquid. Bring to a boil and cook until thickened, about 5 minutes. Stir in the carrots. 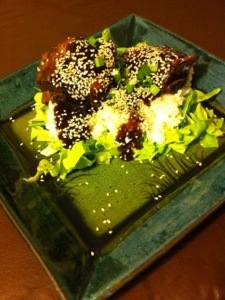 Place the Bibb lettuce (shredded or whole leafs) on the plate, top with rice and short ribs. Add sauce. Then top with green onions and sesame seeds. Voila! Posted in Dinner, Instant Pot, Slow Cooker and tagged Asian food, beef, Instant Pot, korean, meat. Bookmark the permalink.